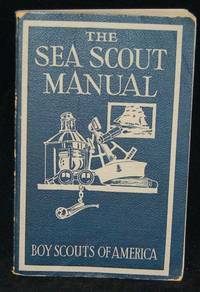 BOY SCOUTS OF AMERICA, 1943 SOFT COVER IN VERY GOOD CONDITION,NAME ON FIRST PAGE. 1st Edition. Soft cover. Very Good. Boy Scouts of America. Paperback. Good. NY: Boy Scouts of America, 1928. 506pp. + iv. pp. index. Illustrated. Joints and extremities rubbed. Ownership inscriptions on the title page. Hinges weak but intact. Size: 12mo - over 6¾ - 7¾" tall. Fifth Edition.. Original Wraps. Good/No Jacket. New York: Boy Scouts Of America, 1939. Softcover. Very Good. Six edition. About very good in wrappers. Book slightly creased on spine, book creased down middle of front and back cover, cover and edges rubbed, two small stains on top foredge, former owner's name on first page.